Yesterday, for the middle of the week, I highlighted the red (hmm, that was fitting). All things considered, it was a good day. However, this morning I did wake with another back spasm. Now that I think about it, muscle spasms are exactly what squares and oppositions feel like: tense, a little painful, catching your attention, and taking your breath away. They do sometimes go away as easily as they come, so I’m hopeful. While the energy wanes from all of that, I am going to shift our focus to the end of the workweek. On Monday, I said it would all come together this week. Thursday and Friday, Mercury and friends are going to tie up some loose strings. Looking back to my post entitled A Dynamic Duo, I wrote about Mercury and Saturn’s conspiring for our greater good. Their third and final trine of the cycle occurs at 4:45 am on the 28th. They’ll connect again in early June, but their Pisces-Scorpio work is nearly complete. My first back spasm what on the right and this one is on the left, so hopefully I’ll be done with this by week’s end. Mercury is picking up speed these days and 24 hours after meeting with Saturn, he’ll conjunct Chiron. That’s fitting because when something conspires with Saturn, it feels like they’re against us. The meeting with Chiron will therefore be like stitches after surgery to promote proper healing. Simultaneous to all that, Venus, the sun, and Uranus will convene. Each is moving forward across the sky at a different rate. Venus will first overtake the sun – moving from a morning star to an evening star. She will then pass Uranus about an hour and a half before the sun does. March 28th will thus start and end with the sun nestled between Venus and Uranus, but opposite in the evening than it was in the morning. It is hard for me to get a read on this triple conjunction, especially because if we consider orb, we have four. Mars will remain within 5 degrees of the others. Take a can of white pain, drip in some dye of one color and then two others, and swirl slowly. That’s just what’s happening in Aries, except with more speed and intensity. I have a feeling this part of the sky is why I’ve been feeling dizzy lately. Aries rules the head and with all of this rearranging going on, I can’t get properly grounded. The fact that only one planet sits in earth is another reason (and that’s transformational Pluto, which is not exactly helping). And if you think the week’s been crazy enough already, there’s more. Early Friday afternoon, the moon will conjunct Saturn in Scorpio beginning the month-long cycle leading up to the next lunar eclipse. In a sense, the moon will sweep in and connect with Saturn, Mercury, and Chiron to make sure we really got it. I would not be surprised if some of us have a quick little cry Friday afternoon to flush it all out. By the way, the activity does not stop there. 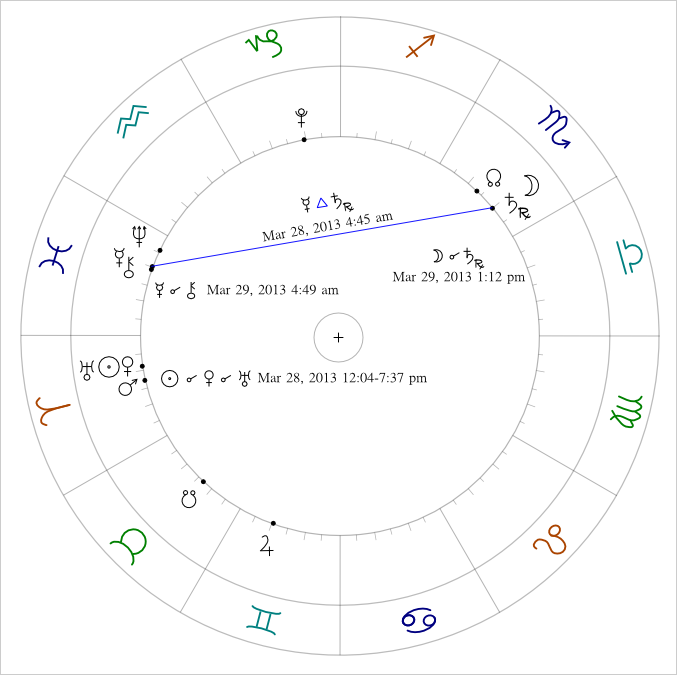 Over the weekend, the sun and Venus will move into the spot Mars occupied on Monday. That means they will each link up to Saturn, Chiron, Jupiter, and Pluto. So all that I wrote about on Monday and Tuesday will be rehashed again, except a tad less aggressively.